Finding the right thermal management solutions is a crucial step in electronics manufacturing. In this series, we will examine three approaches to thermal management, how they work, and their benefits and drawbacks. This month, we draw our attention to two thermal management solutions used in heat sinks: natural conduction and forced convection. Passive heat sinks are a thermal management solution that harness natural convection to cool a desired area. Passive heat sinks use conductive materials such as aluminum extrusions to attract heat from a specific area. The heat will naturally move from warmer areas to cooler areas, thus cooling the CPU or other part. The aluminum heat sink attracts heat, which then moves toward the cooler air, away from the heat-generating part. Passive heat sinks rely on conductive materials and a high surface area to operate. 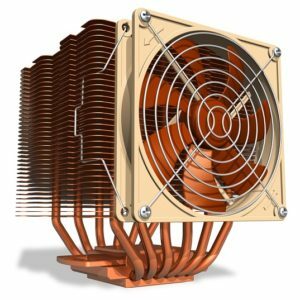 Common material choices for passive heat sink manufacturing are copper and aluminum. 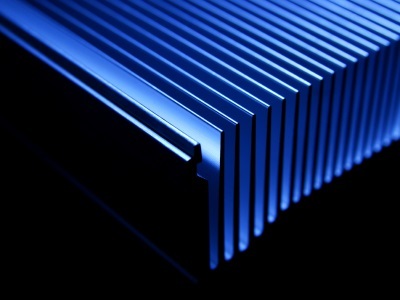 Natural conduction heat sink extrusion manufacturers use densely finned extruded profiles to maximize surface area and allow for more efficient heat transfer. Active heat sinks such as fans use a different physical process to transfer heat: forced convection. Heat naturally transfers to the air surrounding the heat-generating part. Active heat sinks push more air in contact with the part, then push it away, allowing for more efficient heat transfer. Cool air flows through the fan heat sink and against the heat-generating part. Heat transfers from the part to the moving air, then hot air moves out away from the part. Forced convection heat sinks offer more power than natural conduction heat sinks and are often used alongside passive heat sinks to speed up heat transfer. The major downside to active heat sinks is that they can break down or wear out. While aluminum extrusion heat sinks operate under nearly any circumstances, forced convection aluminum heat sinks need periodic maintenance. Do You Need Heat Sink Turnkey Manufacturing? Getec Industrial is a leading thermal management solutions company, offering turnkey manufacturing for heatsink services. For more information about our heat sink manufacturers, contact us online or call us at 888-000-8499.